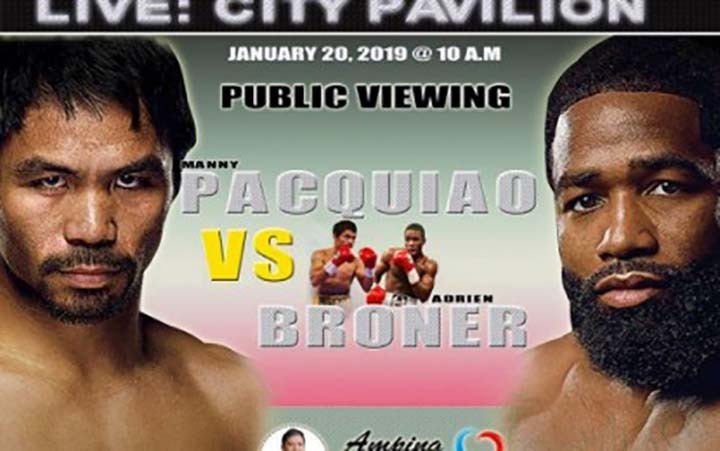 KIDAPAWAN CITY — Boxing aficionados in the city who have no access to live television coverage of the Manny Pacquiao-Adrien Broner fight on Sunday will be able to view the historic bout at the city plaza. Mayor Joseph Evangelista said the city government is putting up a 50-inch TV screen at the city plaza pavilion for the public to see the fight live from MGM Grand Garden Arena in Las Vegas Nevada. “The telecast starts as early as 8 a.m. so the public can also view the undercard bouts,” he said. The mayor also assured the public that security personnel will be deployed around the venue proper along with members of the Kidapawan City police. Pacquiao is defending his World Boxing Association Welterweight (WBA) belt against Broner.